Windows 8 and its later versions are known for their better speed and performance despite it can also face certain performance related issues. One such issue is system slow speed which can happen due to various reasons like over occupied disk space, hardware issues or any other issues. The slow speed of the system not only wastes your time but it affects work quality as well. 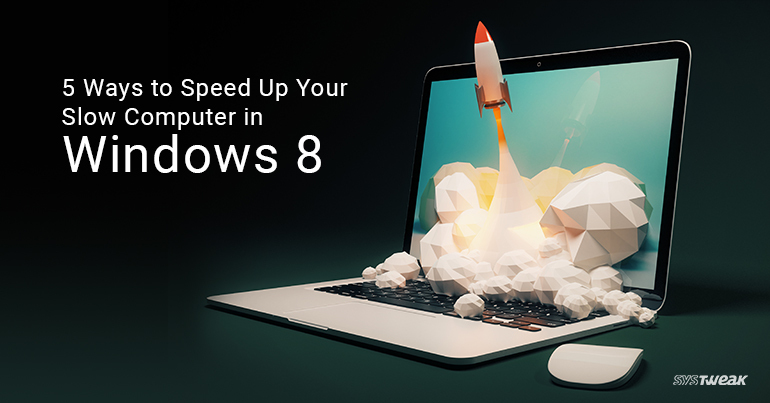 There can be various reasons which cause the slow speed to your system and to deal with these reasons you can follow certain steps for Windows 8 Speed up. Stay updated when it comes to system requirements vis-à-vis software or hardware needs. Where you can’t do much with hardware part but try to update software on a regular basis for the better performance of the system. Apply all necessary system updates so that you don’t get stuck with slow speed or other performance issues. This is one amongst the major reasons why systems get slow or sluggish. When so many programs or applications run in the background while working, it affects system functionality and makes it slow. Try to close all such programs which you are not using to make your system run normal and to speed up your Windows. It is easy now to choose which programs you want to run at the time of system startup. Windows Task Manager allows you to disable all such programs which you don’t want to run at Startup. Go to Task Manager and click on Startup Tab to access these options. Windows also provide your insight about how long each program takes the time to start and displays this information in the Startup impact column. Select the program and click on Disable button to prevent it from starting with Windows. All this process will definitely help you boost up your startup process. When you are trying Windows 8 speed up system, it becomes important to know which apps and programs are making your system slow. Windows 8’s new task Manager now allows you to know those programs which are causing slow speed. To open the Task Manager, right-click on the desktop taskbar and select Task Manager. Click on the More Details if you are not able to see the full interface. All those apps which are using a lot of space will be highlighted thus it will become easy for you to identify all such programs and apps which are causing slow speed. Further, you can remove these apps if not required to speed up windows 8 system. Use system optimization software like Advanced System Optimizer, which offers you to remove unnecessary and junk files in an easy manner. Here we can discuss the advanced features of it. It helps you clean your hard drive by removing old and obsolete files from it. This way your files will load and run faster. It turns your system as a dedicated game machine by blocking all interruptions like Instant messaging notifications, update and all other notifications which may cause a disturbance while playing on the system. By returning to normal mode from game mode your notifications will be active again on the system. It ensures all your system drivers and device drivers remain up to date. Advanced System Optimizer determines which drivers are out-of-date and update them with latest ones. It detects, identifies and clean malware from your system by working as a system protector. It helps you defragment your disk so that your files can load and run faster. You can use above mentioned steps to speed up Windows 8 and to improve its performance. These simple steps will help you save your time and efforts while working on Windows 8. The slow speed of the system not only wastes your time but it affects work quality as well. There can be various reasons which cause the slow speed to your system and to deal with these reasons you can follow certain steps to improve the speed of the system. Is your Personal Data Safe on Facebook?